Built in 1948, the stadium was named in honor of Erv Lind on July 16, 1965, a year after his death. A well-known local florist, he was also the coach and manager of Portland’s best known women’s softball team, the Erv Lind Florists, for 28 years, leading it to two ASA national titles in 1944 and 1964. An annual award is named after Lind and is given each year to the Outstanding Defensive Player in the ASA Women’s Major Fast Pitch National Championship. He was elected to the Northwest Region Hall of Fame in 1984. My grandparents owned that property until the City of Portland decided they needed it for a park. 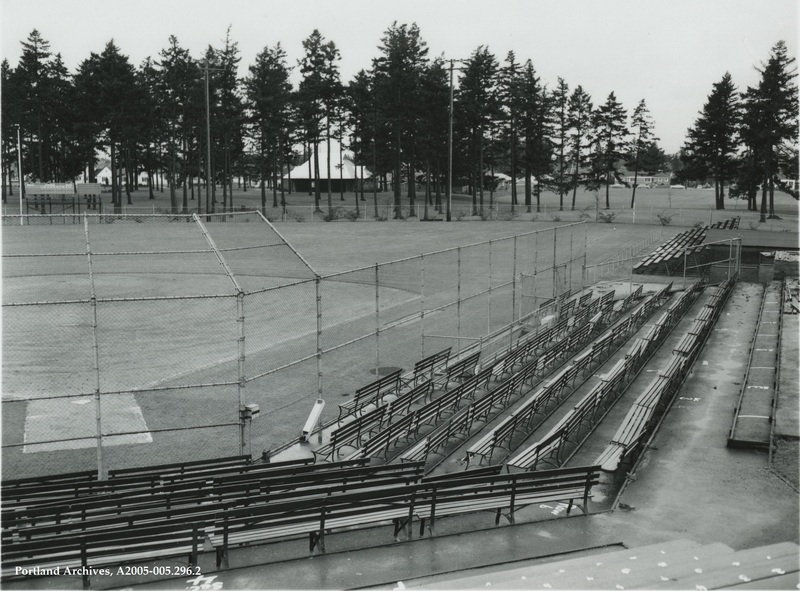 Baseball was big in the 1950s in Portland. My friends and I used to hang out at the games in Civic Stadium a lot. We knew the “secret” way to get in, and we’d go down to the box seats halfway through the game. Good times. I worked at Normandale park for many years, I started out shagging foul balls off the ball diamond to running the scoreboard, in the outfield to working the conssion stand. I did this during the 1950’s. As shown in the photo, the filed is set up for softball. It’s actually a field, not a filed.